Beautiful crystal diamante encrusted rose hair pins. 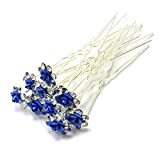 Set of 10 quality hair pins – New with Gift Bag. Silver tone metal finish hair pins each with a metal rose surrounded by a ring of sparkly clear diamantes and available in 8 gorgeous colours: Purple, Gold, Red, Silver, Pink, Green, Blue, Turquoise / Teal. Each pin measures 7cm long x 1.1cm wide. Add a touch of sparkle and glamour to your hair with these stunning hair pins. A must have essential hair accessory for fabulous wedding hair, prom hair and special occasion hair styles. Packed in our Bride Boutique satin gift bag.